The 2017 Joint Contract Interpretation Manual (JCIM), a resource for the administration of the 2015-2018 Collective Bargaining Agreement, is prepared and at the printer! In less than two weeks, members can order their bound JCIM for $6 from the APWU Store . Click here for an electronic copy. 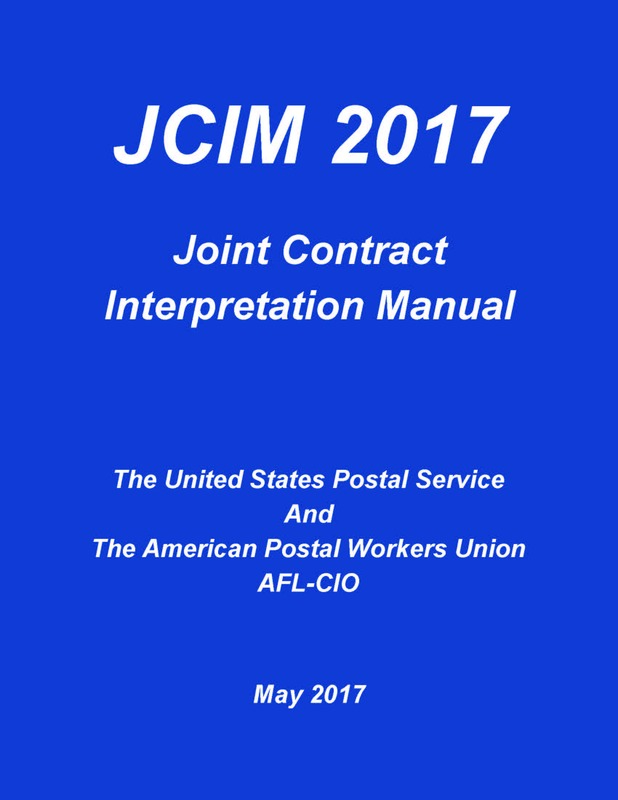 The JCIM is an APWU and the USPS jointly prepared manual. It serves to address and resolve disputes as well as ensure contract compliance. 07/23/2016 – The new contract between the APWU and USPS can now be viewed online. Click here to view the text. The 2015-2018 Collective Bargaining Agreement is the result of a decision issued by Arbitrator Stephen B. Goldberg on July 8. A printed copy will be mailed to APWU members within six weeks. “This contract is the result of a two-year struggle for “Good Service! Good Jobs! Contract Now!” by APWU officers and members – at the negotiating table and arbitration hearings as well as on the workroom floor and in our communities,” said APWU President Mark Dimondstein. “We refused to engage in another round of concessionary bargaining. We made significant progress on most of our major goals. We are stronger as a result of these efforts. “We improved conditions for career and non-career employees – including Full-Time Regulars, Part-Time Flexibles and Postal Support Employees. We gained wage increases in each year of our new 40-month union contract. We protected full cost-of-living-allowances (COLAs) for all career employees. We defended, and even enhanced, our no lay-off protection for all career employees. We gained new job security provisions, including new limits on sub-contracting of MVS and retail work, and on further plant consolidations and closings. We have better defined full-time work, created an all-career workforce in two of our crafts, strengthened career conversion opportunities for PSEs and protected the 50-mile limit on excessing. “And we successfully resisted almost all of management’s concessionary demands – proposals for another new tier of lower-paid career employees, an increase in the non-career PSE workforce, elimination of COLA and weakening of no lay-off protection. “These are major accomplishments. I applaud the role every APWU member played by proudly belonging to the APWU. Many APWU members played a direct part and I salute them all – the officers who participated in negotiations and arbitration; the witnesses, including many rank-and-file union members, who testified; the local and state leaders who helped keep members informed and mobilized, and the members who showed solidarity by wearing union buttons, stickers and T-shirts. Many shared our message with their friends, families and neighbors, and we received great support from our allies in the labor movement and beyond,” Dimondstein said. Click here for detailed highlights of the new contract. Click here to watch President’s Dimondstein’s special contract video. 07/08/2016 – The big news is in – 200,000 postal workers represented by the APWU have a new union contract! Below is a summary of the main highlights of the new award (for a full copy click here.) All provisions of the previous contract that remain unchanged carry forward into our new contract including seniority and bidding rights, the grievance procedure, protection against unjust discipline, annual and sick leave, holiday and overtime pay and all the other important union benefits we have won over many decades of struggle. The COLA for career employees is maintained under the current formula. Cost of living adjustments will be made in March and September of each year of the Contract. The no lay-off protections of Article 6, for employees with more than six years of service, remain in full force. In addition, no lay-off protection is extended to all career employees who are on the rolls as of July 8, 2016. This protection covers the 32,000 postal workers recently converted to career who have not yet achieved the six year threshold of no lay-off protection. There will be no new subcontracting of PVS driving work during the life of the contract. There will be no further plant closings and consolidations until at least April 2017. All Maintenance Craft PSEs will be converted “in place” to career within 60 days of the Award. Thereafter the PSE category of employee will be eliminated in the Maintenance Craft. All Motor Vehicle Service Craft PSEs will be converted to career – either full-time or PTF – within 60 days of the Award. Thereafter, the PSE category of employee will be eliminated in the MVS Craft. However, in the future PSEs could be authorized as part of a package to bring back currently subcontracted MVS work. PTF employees are reintroduced into the MVS craft, not to exceed 20% of the MVS career workforce. Non-Traditional Full-Time (NTFT) duty assignments are eliminated in Function 1 (mail processing) and Function 3 (MVS) and will be reposted as traditional full-time duty assignments. NTFTs cannot be introduced into the Maintenance Craft. Current four day a week/ ten-hour a day duty assignments may remain in place if the local parties agree. Local parties may mutually agree upon more such assignments under the Modified Work Week Memo. Non-Traditional Full-Time employees in Function 4 (Retail) are now capped at 8%, excluding NTFT assignments in POStPlan offices. (Previously there was no cap.) The rules concerning schedules and postings in the NTFT memo remain. However, the restriction on assigning mandatory overtime to non-OTDL employees is narrowed from installation wide to the facility. Preference Eligible Veteran hiring will be greatly enhanced with the creation of the all- career workforce in the Maintenance and MVS Crafts where Veterans will now be hired directly into career positions. The Health Plans and benefits for career employees remain in effect. Over the next three years, the employees’ portion of the health premium will increase 1% a year. For the APWU Consumer Driven Health plan, the Postal Service will continue to pay 95% of the premium. The number of hours paid for the holiday will vary by size of office: 200 Man year offices – 8 hours. POStPlan offices – 4 hours. All other offices – 6 Hours. PSEs who work on a holiday will have the same option as career employees to have their annual leave balance credited in lieu of holiday leave pay. The 75% contribution of the USPS to the premiums of the APWU Consumer Driven Health Plan, available after one year of service, remains in effect. In addition, PSEs will now have access to a USPS sponsored health plan upon employment with the USPS contributing $125.00/pay period. During the life of the CBA, no employees can be excessed beyond a 50 mile radius. Parties established a joint Service Enhancement and Innovation Task Force authorized to discuss research, and consult experts with a goal of agreeing to programs including pilots to implement agreed upon services and practices. At least one pilot program must be implemented within 12 months. PSEs employed in retail for the first time will receive an annual uniform allowance for three shirts, subject to the normal eligibility requirements. Incorporates successful MOU “Re: Filling of Residual Vacancies” into the Contract. New pecking order for full-time vacancies allows for a possible PTF transfer and conversion of PSEs within a 50-mile radius. New pecking order for PTF vacancies provides for conversion of PSEs within the installation, the transfer of PTFs within 50 miles and conversion of PSEs within a 50-mile radius. PTFs can express a preference to work outside their installation. One-time conversions of all Clerk Craft PSEs in 200 work year installations with over 2.5 years of service as of July 8, The conversions will be completed as soon as practical but no later than 60 days from July 8, 2016. One year from the award, the parties are ordered to discuss the possibility of another one-time conversion. New language in Article 37.5.D that streamlines process for PSE conversion to career. eReassign Task Force established to explore improvements to the posting and placement process. Employees can now exercise retreat rights without regard to level. All Maintenance Craft PSEs converted to career and the PSE category eliminated. Maintenance Jobs MOU eliminated except for provisions related to pending disputes over “Unit Clarification”. Significant improvements to excessing provisions in Article 38.3.K. New provisions for ET-11 issues including a nationwide PAR for ET-11s and negotiations for LMOUs with MTSC. Retained the Subcontracting Cleaning Services MOU with entire installation in the 18K sq. ft. formula. Retained the 50-mile rule on excessing. New pecking order putting APWU bargaining unit employees ahead of non-APWU employees for in-service register selections. All MVS Craft PSEs converted to career and the PSE category eliminated except when part of package to bring in contracted work. Numbered paragraphs 1, 3, and 4 of the 2010 Motor Vehicle Craft Jobs MOU terminated Paragraph 2 remains and includes the evaluation of 8,000 HCR routes for possible return to PVS. No new subcontracting of PVS driving work during the life of the contract. Because of the loss of flexibility with conversion of all PSEs, elimination of NTFT assignments and restriction on sub-contracting, the Award provides for the return of PTFs with a 20% cap. Clarification of policy regarding Vehicle Maintenance Agreements (VMAs) in offices with vehicle maintenances. All Full-Time Regular Motor Vehicle Craft employees – not just operators – will use their seniority for vacation scheduling. Bids for Examination Specialist (SP-2-188) and Vehicle Operations – Maintenance Assistant (SP-2-195) are open to all full-time regular MVS employees.